Discover views good enough to eat in Northumberland and give your taste buds a treat. With 80 miles of stunning coastline, seafood doesn’t come any fresher than that landed in Northumberland’s coastal villages. Enjoy our famous Craster Kippers and Lindisfarne Oysters with the stunning backdrop of the Northumberland Coast. Northumberland is a vast, rural county packed with market towns which are rich in history and heritage and with an iconic, timeless feel. Acting as hubs to the local communities they hold regular farmers markets’ selling the best local produce Northumberland has to offer. From quintessential country pubs to cheerful coastal inns, our public houses each have a character all of their own. The Ship Inn, overlooking the beautiful sandy beach of Newton Haven produces 20 beers in their own micro brewery – the beer travelling just 15ft from brewery to cellar! Northumberland is also a haven for fine dining; Matfen Hall and Eshott Hall have both been awarded 2 AA rosettes and Doxford Hall 1 AA rosette. Northumberland is packed with attractive pubs dotted around towns and villages on our coast and countryside. Offering a warm welcome, freshly brewed ale and fantastic locally produced food it’s no wonder visitors keep coming back for more. Restaurants can be high profile or quietly tucked away on a cobbled street just waiting to be discovered. Either way you won’t be disappointed! We love a cup of tea in Northumberland – the birthplace of Earl Grey and his namesake tea and we have an array of cafes to choose from. For those a little hungrier we’ve got some fantastic places for a light snack or belly busting 'stottie' sandwich, washed down with a pint of local ale. With so many fantastic picnic spot to choose from you could always pop into your local farm shop and put your own lunch together? Whichever way you decide to dine Northumberland has plenty of options to keep you satisfied! Remote hillsides covered with heather, forests and rolling parklands yield a game bounty that is second to none. From early season grouse and moorland rabbits to plump pigeons and wild ducks a fantastic game pie is always on the menu. Experience ‘Lake to plate’ at Kielder Water & Forest Park which was voted the best tourism experience in England, making it perfect for individuals or families that love nature, exploring, walking, fishing and great food experiences. Enjoy home cooked local produce at the Boat Inn restaurant at Leaplish or a tasty snack at Café on the Water at Tower Knowe. Covering almost a quarter of the county, Northumberland National Park is officially the country’s most tranquil location. A place for adventure , or relaxation you can be as active or as laid back as you want. Tea rooms and cafes serving amazing home baking provide the perfect end to a day in the National Park. Guilt-free cakes! The longer the walk...the bigger the slice. Situated on the banks of the The River Till on the Ford & Etal Estates, Heatherslaw Corn Mill is the only working water mill in Northumberland. Wheat from fields on the estate is ground by the 16 foot water wheel to produce high quality, stoneground wholemeal flour. Explore the historic building, watch the milling process and see the 21st Century millers at work. 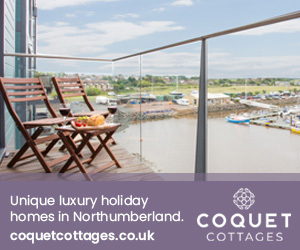 Northumberland offers plenty of choice for places to stay from cosy country pubs to romantic country house hotels, welcoming B&Bs or cosy self-catering cottages.